This is a post from a current ISB student on his experience at ISB. In case you are looking for outstanding ISB application help or admissions consulting services, please check out our offering by clicking here or contact us using the contact form on the sidebar to the right. In an earlier post, Akshay Gupta had written about his journey to ISB – his dream school. In this post, he writes about life at ISB (Mohali campus). One can never imagine life at ISB till one actually gets there. At the time that I joined ISB, I had many questions in mind. Was my decision right or wrong? After having 7 years of experience, will I be comfortable studying? How will I adjust because I am going to college after such a loooong time………? How will I live without my family and with new friends? The list is never ending. All the ifs and buts gradually faded away once I started my roller coaster ride. Now after completing my journey of four weeks@ ISB, I can say with confidence — “Yes, it’s true. ISB is what—- it claims to be.” Life at ISB is indeed great. ISB’s biggest strength is its Diversity. Here you will find diverse people from various backgrounds. Everyone is special and unique and that’s why he or she is here. One will realize this in the first week itself, when one’s life at ISB kicks off through the “O-Week”. The programs in the O-week are phased in such a manner that you start getting a good feel of diversity on campus and what is means to your own learning and experience. One will realize this to its fullest extent when the classes start. You will get to know more about your peers in your own section and most importantly your study group. Even if the educational qualifications of two individuals are the same, their professional experience and how it has shaped them is totally different. You will find it in your study group as well, where there are usually 4 to 5 people but all still have very different backgrounds. The study group is where you spend more than half of your time, so getting to know your group and working with them is critical. Over time, they become not only your study mates but also great friends. Diversity stimulates one’s process of learning at ISB. Here, I am not only learning from the world’s best faculty (from schools such as Wharton, LBS, and Kellogg) but also from my peers through class room discussions. The illustrations or case studies that are used to explain a concept are always linked to real life situations. The concepts are explained in such a manner that one can never forget them. As an example of exactly this, I was quite surprised when the simple concept of diminishing marginal utility or rationality of individuals was proved in the class while conducting experiment on my classmates as part of the Economics course in Term 1. Reading about something is one thing, but seeing it in action is quite another. The focus is only one —-learning and understanding than mugging the concepts or theory. Even concepts that I thought I was quite familiar with are presented in a different way which facilitates deeper understanding. Life and learning at ISB has already changed me and made me a little more wiser. Sometimes, I look back and wonder how I could have been even more effective at work if I had developed a deeper understanding of some of these concepts even earlier. Perhaps that is why one goes for an MBA! While learning and understanding are the fun aspects of life at ISB, there is also a lot of hard work that goes along with it. – a lot of pre reads, individual assignments, and study group assignments. The classes are held only four days a week and for 4 hours every day. Now, before people out there begin salivating at the prospect of a three day weekend, let me put things into perspective – the weekends are busier than the weekdays! One has to spend sleepless nights (sleeping at 3-4am is the norm here) and still be ready the next day for the next bit of work. Mid-term and final exams arrive regularly after every 2 weeks. One has to be on one’s toes all the time. While this schedule is very very hectic, I am sure I will miss this too after 11 months, as alumni of ISB tell me. Learning and living in an intense environment is a lot of fun! One should also not feel stressed knowing the hard work ISB expects from students. ISB makes sure that you are not stressed. There are ample opportunities available to de-stress yourself such as dance, music, sports, and competitions. The most important thing is the bonding with friends that one will develop here gradually. 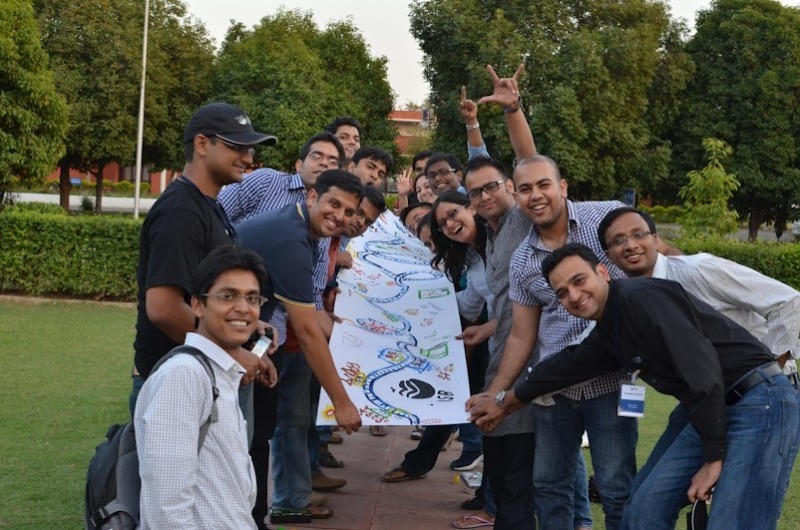 ISB believes in one notion – “everyone is part of one ISB family”. This is absolutely true. It has been only four weeks and it appears as if I know this place and am part of the big ISB family for ages. People are very friendly and are very willing to help whether one faces difficulty in studies or in any other field. In ISB there are many peer to peer learning sessions and I am also taking tutorial sessions in finance and accounts for the benefit of my peers. This has helped me to develop a stronger association with peers and improve my confidence. Finally, readers must be wondering how students manage to take care of their daily stuff in such a hectic schedule. ISB asks its students to focus on learning and leave everything else to them. The school even takes care of stuff such as daily housekeeping, laundry, and food. I still have 11 months more to go to graduate from the program, and I am sure that my journey of learning has just started. Time will fly by very quickly this year. The best one year of my life has just begun. As the ISB alum chant goes, “ISB ROCKS”.